Most of you know we live in Florida on the space coast and we are grateful for and enjoy the warm weather all year round. This weekend is a big one for the artists in this area, and at the moment …. it is raining (excuse me…) cats and dogs. So if you would please put your collective will behind it and hope for dry weather for this weekend, it would be greatly appreciated. This weekend is ArtWorks Fine Art Festival in the Eau Gallie Arts District. If you’re in the area, it’s a great festival. It’s all along Highland Avenue and the side streets in Melboure, Florida. ArtWorks consists of about 100 artists, selling their creations as well as demonstrating how they do their art. In addition to the art festiva l, is the Meet the Authors’ book fair. It consists of 40 authors signing their latest novels and non- fiction books. 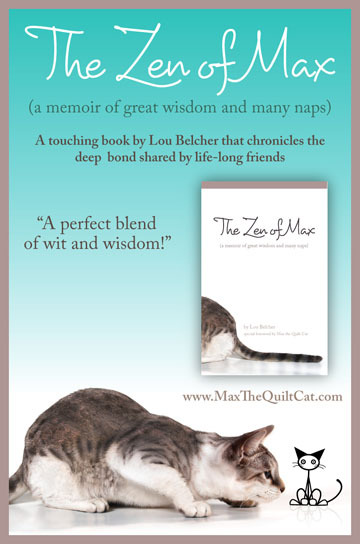 I’m participating in that part of the event and will have copies of The Zen of Max (a memoir of great wisdom and many naps) for sale. Another part of the festival is a Chalk Art event in the street… (we definitely need the rain to stop for this one). And in another corner of the civic center is the Brevard Porcelain Society show and sale. As you can see, there is something for everyone. So…. we could use some nice weather for this event. In any case…. we’ll have a great time and the radio says that they are expecting 15,000 people to stop by. Hope that means all of you, too. This entry was posted in art, writing general and tagged art fair, book fair, Zen of Max. Bookmark the permalink. 11 Responses to Art and Writing …. all in one place. What could be better? Hope you have a great time. Have a fabulous Friday. thanks… we’ll report on how it went. It should be a great weekend for you. Yes, hope the weather clears up – more people will come out for it. Enjoy. Oh my gosh! BEST of luck. I think you’ll have a GREAT show! How could you miss with your lovely talent and your happy work!! Happy Friday! Thanks for the encouragement Cheri… Love it. I have my fingers crossed for you, and Nicki and Derry are crossing their paws. Good luck! fingers and paws… Perfect combination. Will report in on Monday.